The Bill Hogarth MBE Memorial Apprenticeship Trust (BHMAT) was set up in February 2000 in order to ensure that the coppicing skills of Bill Hogarth are recognised for their full worth and their continuity secured by setting up a broad based apprenticeship scheme. We are a group of concerned individuals involved in various ways in the coppice industry. Our focus is the North of England although we have links to other regions. We achieved charitable status in 2001. To train apprentice coppice workers in coppice skills. To promote the management of broadleaved woodland using environmentally sustainable methods which encourage bio-diversity. To support the coppice industry in its endeavour to provide an economically viable use for our native woodland resource. To raise public awareness of the coppice industry and provide enhanced opportunities for people to get involved. We run a three year apprenticeship that leads to the Bill Hogarth Coppice Diploma based in the North of England. We currently take on around two new apprentices each year. We always welcome coppice businesses that would like to act as sponsors to an apprentice to come forward. We are dependent on external funding and charitable donations (download a donations form here - 30Kb Adobe) to secure the training of our apprentices. William Henry Hogarth MBE was born in Lytham-St-Annes, Lancashire in 1929. His family emigrated to Canada when he was 2 but returned five years later to live in Blackpool. His father got a job with a coppice merchant near Ulverston and soon moved the family to Spark Bridge, Cumbria, where Bill remained for the rest of his life. He left school at 14 and joined his father in the woods, dressing and tying hazel for ships fenders. When he was 18 he left to do his national service, spending two years with the Royal Navy on HMS Victorious and then spent a short while in a factory in Ulverston. He continued to do coppice work in his spare time, however, it wasn't long before he returned to life in the woods full time. In the early days the main demand was for coppiced hazel for ships' fenders, poles for the bobbin mills and bundles of birch for the steel mills. By the 1960s these markets had dried up and many of Bill's contemporaries had retired or moved onto other work. He, however, weathered the lean 1970s peeling oak for rustic furniture and making besom brooms. By 1979, he was the only coppice merchant still in business in the Lake District. In the early 1980's when Bill began to be approached as a source of knowledge about coppicing and coppice crafts his response was open-hearted and generous. He soon became dedicated to passing on his skills to anyone who showed an interest in his work. Many people attended courses he taught in this country and in Ireland, and were inspired by his skill and the ease with which he moved around the woods bundling and stacking wood. Many were also captivated by his stories and the way he made his great skills look so easy. He was always very generous with his knowledge and endlessly encouraging to anyone who wanted to get involved in coppicing. 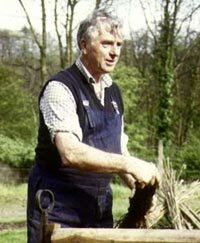 In 1995 Bill was awarded an MBE in recognition of his services to the Coppice industry. He was very proud to receive that award and in the same year to be unanimously voted winner of the 1995 Living National Treasure Award from the Country Life magazine. Bill continued to work in the woods until he died on February 25th 1999. By the end of his life he had supplied one hundred different coppice products ranging from hedging stakes to barrel hoops and walking sticks to hurdles. After his death many of his friends who had learnt valuable skills from him wanted to pay tribute to his life and continue the work of training coppice workers. In 2000 this resulted in the formation of the Bill Hogarth (MBE) Memorial Apprenticeship Trust.